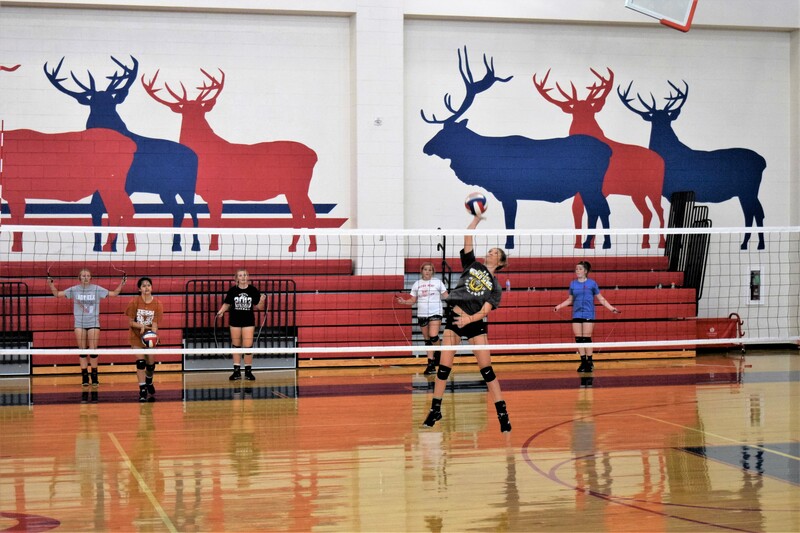 ELKHART – The Elkhart Lady Elks are looking to make some noise in their new district according to Volleyball Coach Brandi McEnturff. “We have six returners so we had five to six holes to fill,” the coach said. As to the weaknesses, she indicated the lack of depth and replacing the players lost to graduation would be hindrance but one which could be overcome as the season progresses. “The biggest weakness as a team – right now – would be the communication part and learning who we are playing beside, what they’re good at and what they like,” she said. The Lady Elks will be in District 20-3A along with: the Buffalo Lady Bison; the Crockett Lady Bulldogs; the Frankston Maidens; the Groesbeck Lady Goats; the Westwood Lady Panthers; and the Teague Lady Lions. Players to watch for include: Madison Crader; Rylee Reeves; Laci McEnturff; and Ashlyn Mattern. “I think everyone is going to be surprised, as a whole. I think you’re going to see a lot of the kids step up from in the past,” she said.